Here is the third and final part of this trilogy of episodes about the latest Star Wars film. In this one you'll hear a conversation between my Dad, my brother and me that I recorded just after we'd seen the film a couple of weeks ago. Now, I know that this is perhaps a bit too much Star Wars content on this podcast. Even if you are a fan it might seem like overkill. So let me emphasise the value of the conversation in this episode as an opportunity for you to learn some natural English in an authentic way. You'll hear us talking spontaneously and then in the second half of this episode I'll to explain some of the bits of language that come up in the conversation. So, this isn't just chat about a film, it's a way to present you with real British English as it is actually spoken. As you'd expect we were feeling quite excitable after having just sat through 2 and a half hours of intense Star Wars action and we were also slightly tipsy on French wine and so the conversation is quite animated and lively. You will hear us talking over each other a bit. Not every sentence is completed. Some words get cut off as we interrupt each other and although that's all completely normal in conversations like this, it might be difficult for you to understand everything, depending on your level of English, but watch out for various nice expressions that pop up during our chat. I'll be explaining some of them later in this episode. Right then, let's hear that conversation now - and remember of course that this will contain lots of plot spoilers for Star Wars Episode 8 - so if you haven't seen it yet, please do so before you listen to this. This is your final warning - plot spoilers are coming - please do not let us spoil your enjoyment of the film. You could always come back to listen to this episode later if you want. Near the end of the conversation there you heard my dad and my brother expressing their doubts about whether this conversation might be either too difficult for you to follow or simply boring for you to hear because of the slightly geeky levels of detail about Star Wars. That's quite a frequent reaction from them, isn't it. It's a bit annoying when they say that kind of thing, but to be honest, I think they've both got a point, to a certain degree, and this shows that making podcast content for learners of English can be a bit of a tightrope. 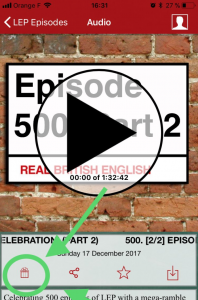 Episodes should be clear enough for learners of English to understand, but at the same time spoken at a natural speed to make them authentic. I want to be able to explore subjects in some depth and detail so that the content is original and insightful without episodes becoming too specific, too long or simply uninteresting for you to listen to. It can be tricky to walk that line. The fact is, it's probably impossible to get it 100% right every time and produce episodes that are popular and useful for absolutely everybody across the board. But in the end I'm not going to worry about it too much. I expect I lost a few people with all this talk of Star Wars, but if that is the case - so be it. Looking on the bright side - maybe those of you who share my enthusiasm for these films have really enjoyed this trilogy. In any case, that's it for Star Wars for a while. Now, let's focus our attention on language - specifically vocabulary. What about some of the expressions, phrasal verbs and other bits of language that you heard? I've been through the conversation again and made a list. It's quite a big list. I wonder how many of these phrases how many you noticed and how many passed you by. We'll see. Let's go through them now. And this isn't Star Wars vocabulary - it's all English that you can use to talk about all manner of different things. Your daughter is gorgeous and all in one piece, and very healthy and alert. It's a wonderful thing and I'm now an uncle. Dad: I'm wearing a flat cap, smoking a pipe, sitting by the fire and dozing. James: No change there then. There's been a big backlash against this film from the die-hard fans. It doesn't have the same wow factor as before. So they're exaggerating everything to keep it going. It didn't have the same feeling as the originals, that's what you can boil it down to. I was defending the fantasy genre with terminal intensity when what I should have said is Dad, you're right, but let's give Krull a try and we'll discuss it later. Tim, I'm going to have to let you go. I thought they could have done without the cute creatures. It's a bit of Ewokism here. I'm not one of these rabid fans. I'm starting to warm to the new characters. Dad said there were too many explosions. James: I know what you mean. It's the law of diminishing returns. You see one explosion and it's "ooh wow", and you see 100 explosions and it's like "meh". The extractor fan/lettuce shredder - They should have a grill over that or some sort of guard rail. It's a health and safety issue. It's a health and safety nightmare. To me, it needs a bit of lightening up. I don't want it to be like one of these superhero films like Batman where everything's deadly serious and shrouded in seriousness. Come on it's a kid's film - just lighten up! On milking the sea alien - I thought that was wrong on many levels, but I laughed. Were you disappointed that we didn't learn anything else about him, that he just died? James: No I was glad to see the back of him. On Luke throwing away the lightsabre. Dad: He didn't hurl it into the sea, he just tossed it over his shoulder. Maybe Chewie did eat the porg. Dad: I think, "Chewie" - the clue is in the name. He should have chewed into that porg. He'd coached this trainee jedi, his nephew, who had perfect credentials, good bloodline. You can see that we're running out of steam. Did you like the new AT-AT walkers? I thought they were sick. I liked the way they walked on their knuckles. I thought it was funny the way they look like they're grumpily stomping along on their knuckles. It didn't feel like they jumped the shark. At least I didn't sigh in this episode.